Eat your way around the world—and San Diego—one meal at a time. From Abyssinian to Vietnamese, there is no shortage of international cuisine in the region. Here are just 13 to get you started. Follow your taste buds to get an idea of the incredible variety and deliciousness of San Diego’s diverse food landscape, no airfare required. It’s not all borscht and meat dumplings at this Russian-Georgian gem (although, yes, they have delicious examples of both). A panoply of salads—not based on greens but made from shredded vegetables like cabbage or carrots—adds to the menu of meat turnovers, fried Cornish hen, smoked rainbow trout, pizza-like flatbread, and baked apples filled with fruits and nuts for dessert. Mexican food is San Diego’s culinary backbone. And no matter how long you’re here you won’t be able to try every delicious item (even an entire lifetime wouldn’t be enough). But lovers of ceviche should quit messing around and head right for this North Park establishment with a roomy outdoor seating area. Their range of octopus, shrimp, scallop, and smoked yellowtail ceviches in a vaguely Baja-esque style gets right to the point with healthy amounts heaped on tostadas. There’s no trace of Pacific Beach’s typically rowdy bar and restaurant scene in what many consider San Diego’s original Spanish food destination. Ensconced behind a wall of green hedges, authentic Spanish dishes like paella mixta and a slate of tapas are served with housemade sangria and—on Wednesdays, Thursdays, and Sundays—a dash of live flamenco music. 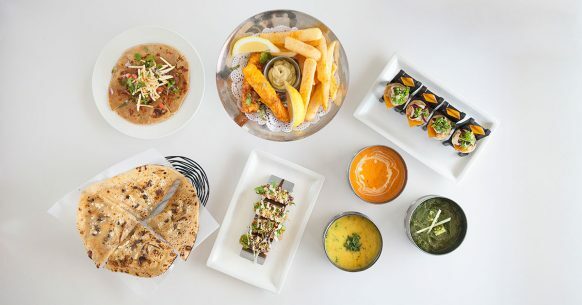 The proprietors of this La Jolla restaurant will be the first to tell you: Do not come here looking for a standard Indian buffet of uninspired mainstays. Chef Hemant Oberoi’s creation is an elevated expression of Indian classics made with high quality spices and fusions like the “tacosa,” a samosa-taco hybrid served with spiced potato, mung beans, and yogurt. Don’t worry if you’re not acquainted with injera (a crepe-like bread) or tesmi (seasoned, clarified butter). The menu serving Eritrean and Ethiopian food made with local produce has a few explainers. So the uninitiated will feel right at home. From the outside, one of San Diego’s best sushi places—tucked into a strip mall adjacent to a 7-Eleven on Mission Bay Drive—doesn’t look like much. When you lay eyes on the sleek interior, and of course taste the exquisite Japanese cuisine, you’ll understand why it doesn’t have to. Spring rolls, pastries, and drinks accompany the bahn mi varieties that have propelled the reputation of this Linda Vista establishment near the 805 and 163 freeway interchange. Beef, pork, sardines, and cold cuts are served with housemade mayonnaise, pickled vegetables, cilantro, and other fixings on fresh baguettes. You could thank founder and Bergamo-native Matteo Cattaneo for the fettucine, pappardelle, rigatoni, and other pasta dishes that have placed this South Park eatery on every San Diegan’s list. But for the perfectly crispy and fluffy Neapolitan pizzas you’d have to compliment Sofia, the restaurant’s wood-fired oven handmade in Naples. Formerly a food truck, das purveyor of German street food recently opened a forever home at the Westfield UTC mall where it will continue serving its namesake sausage (steamed and grilled wurst doused in curry ketchup), plus bratwurst, frankfurters, and—you guessed it—sauerkraut and red cabbage. Order for the whole family reunion or dine inside on lumpia, dinuguan, pork menudo, sinigang, and other Filipino staples. This restaurant in Cherokee Point is cash-only and sells leather purses and some convenience store items because—well, who needs a reason when the food’s this good? Find your way to a strip mall in Oceanside for the finest Peruvian cuisine this side of Lima. You’ll find the expected meaty entrees like rotisserie chicken and stewed meats alongside Peruvian sandwiches, a few kid-friendly dishes, and made-from-scratch desserts like shortbread cookies, passionfruit mousse, and vanilla custard. Authentic southern Brazilian barbecue is slow-cooked over open flames while diners toast Caipirinhas. You can get all of that! Plus fried yucca, cheese bread, guava beef sliders, salads, and chocolate bonbons at this Encinitas eatery. Experience this unique venue with your closest loved ones, your fellow comrades, or your best friends – let the flavors, décor, ambiance, and pictures take you to the island of Cuba. Havana 1920 brings Hemingway’s Cuba to life with authentic Cuban dishes, drinks and entertainment. This entry was posted in Culinary and tagged county, culinary by San Diego Magazine. Bookmark the permalink.